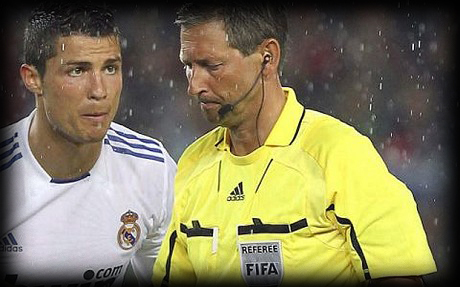 04.05.2011 » Cristiano Ronaldo: "Winning would have been Mission Impossible IV"
Cristiano Ronaldo charged again against Barcelona and the referee and said that last night's game could have been named as "Mission Impossible IV". CR7 complained about the strange help Barcelona gets everytime they are in trouble and said that next season, it's probably best that UEFA deliver the trophy immediatly to Barcelona. After last night match against Barcelona for the UEFA Champions League semi-finals, Cristiano Ronaldo talked to the journalists and showed his anger for the way the referee Frank de Bleeckere influenced the game. CR7 remembered what had already happened last week in Santiago Bernabéu and said that achieving the "remontada" in Camp Nou, could be titled as "Mission Impossible IV", alluding to the movie saga that ended after the release of a 3 movies sequence. Cristiano Ronaldo: "We knew what was going to happen already. We are used to it and we have to live with it. They robbed us the opportunity of reaching the final, by doing again what everyone saw last week, in the Santiago Bernabéu. Here they just did more of the same and it's a lot of things at the same time. What happened today and what happened in the Bernabéu, just make us wonder if it's worth it. Higuain's goal should have been validated but they disallowed it. Barcelona has a great team and they don't need help from third parties. There's the feeling there's always some sort of a hidden power, helping them when they need", said the Portuguese ace (You can watch the video with José Mourinho and Cristiano Ronaldo "robbery gestures" here). Another Cristiano Ronaldo's target was Javier Mascherano, who CR7 believes to have been "corrupted" by Barcelona's theatrical mentality: "In England, Mascherano never used to dive, but here in Spain, whenever someone touches it seems like he dies. He wasn't like that in Liverpool, but here he learned Barcelona tricks". Cristiano Ronaldo kept on the same note and didn't hold his thoughts to fire on Barcelona and the referees: "This isn't only about football, there's a lot of things and interests behind it. It's really hard to play against so many adverse circumstances." CR7 complaints reached the climax when the Portuguese player shouted: "For this to happen it's better not to come next time, howver Real Madrid is a noble and respectable club. But next season, it's probably better if they just give the trophy to Barcelona right on the beginning." Remember that you can watch Sevilla vs Real Madrid livestreams, for the Spanish League, online here on ronaldo7.net, this Saturday. Cristiano Ronaldo will probably play, but news on this matter will be released later on this week.